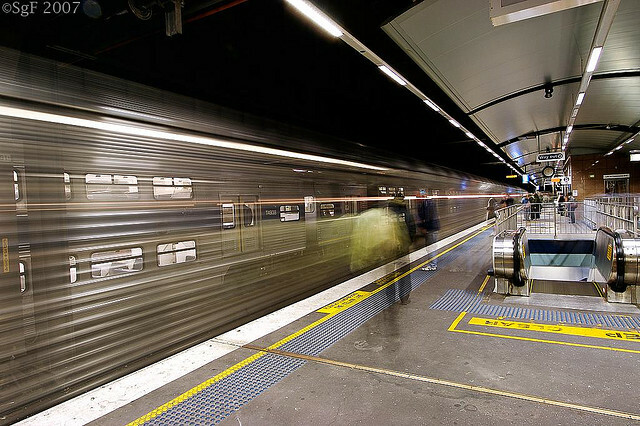 A train arrives at Circular Quay station in Sydney. Photo by Sacha Fernandez. Integrated ticketing has been promised in Sydney since 1993. It was meant to have started in time for the 2000 Sydney Olympics, but disagreement between the government and the contractor meant the system was never established and ended up costing taxpayers close to AU$200 million. However, the recently elected government seems committed to getting the system running. While Sydney’s ticketing systems for buses, light rail and ferries will mesh fairly easily with a new integrated system, heavy rail (run by CityRail) uses a very dated ticketing regime. With that in mind, here are the top seven issues to consider for the current CityRail ticketing system to encourage more Sydneysiders to get on board. Sydneysiders pay the same for a single trip as for a return trip. Buying a return ticket saves CityRail money by printing less tickets and serving less transactions at the ticket office, so why not pass the savings on to passengers? Although few other rail systems offer discounted return tickets, they do offer discounts on multi-trip credit top-ups. New York, for instance, gives a 7 percent discount on pay-per-ride credit top-ups of $10 or more. At the moment, traveling during peak hour on CityRail trains is 30 percent more expensive than in off-peak periods. Ironically, peak hour travelers are less likely to get a seat and the frequency of service is no better than in the off-peak periods at many suburban stations. Peak hour travel also costs more in London, but there is no peak hour surcharge in Berlin or New York. If governments want to get more commuters out of their cars, maybe discounts during the peak hour would be a better approach. CityRail fares are based on distance. This probably discourages people in the outer suburbs from using the train rather than the car. The fare cut-off points are quite arbitrary and can lead to situations where commuters crowd into stations 200 meters farther down the line to be closer to the city and save 30 percent on their fare. Single trips anywhere on the New York subway cost US$2.50. Restrictions on breaking your trip, i.e. leaving the station part way through your journey to rejoin the trip later, are pretty common in cities around the world. However, having to pay a second time when breaking a trip is usually simple for commuters because they pay a flat fare. In Sydney, trip-breakers need a new ticket that specifies their destination and may be a different price. This adds complexity to the process. Sydney’s buses use a multi-trip system that allows 10 trips, at a discount of 30 percent on single tickets. New York has Pay-per-Ride with a 7 percent discount. CityRail has no equivalent ticket for multiple trips, and the only option is a time-based weekly, monthly, quarterly or annual ticket. If you ride the trains infrequently, get sick or go on holiday, there is no value for you in buying multi-trip tickets based on time. Single CityRail tickets are only valid until 4:00 a.m. the following day. This means that someone traveling late at night and wishing to return the next morning after 4:00 a.m. must buy two separate tickets, rather than use a return ticket. Plus, trains don’t operate between midnight and 4:30 a.m. and are replaced by buses running only every 30 minutes. Making tickets valid for a 24-hour period would be much more fair. This last point may seem the most archaic to non-Sydneysiders. Every ticket issued on CityRail trains (apart from some tourist and pension tickets) specifies the stations where the trip must start and end. A ticket does not allow you to travel within a given zone, for example, six stations in any direction. It allows you to travel between two specific stations. Virtually all other networks in the world that don’t use flat fares or fully electronic ticketing use a zonal fare system. Even in Sydney, the bus network has used a zonal system for decades.